Success has taken a long time — it certainly didn’t happen overnight. It was a slow and steady plod every year to be better and to be very customer-focused so that we can deliver products consumers want to buy. WHAT WAS THE INSPIRATION FOR YOUR COMPANY? WHEN AND WHERE DID YOUR STORY START? I started this business in 1992 when I was an 18-year-old uni student. I was working in a little bakery one day a week making muesli and they told me I was going to lose my job as the business was to be sold. So, for $1000 I bought into this little business 24 years ago. That’s how Carman’s started. It was more about just taking an opportunity. When it passed my way, I said, “Hang on! I am making the muesli — why couldn’t I be the one who bought this little business?” So, it was about recognising the opportunity and giving it a go. Success has taken a long time — it certainly didn’t happen overnight. It was a slow and steady plod every year to be better and to be very customer-focused so that we can deliver products consumers want to buy. I never imagined it would be as big it is today, but you know it’s been 24 years! It’s a long, long time. 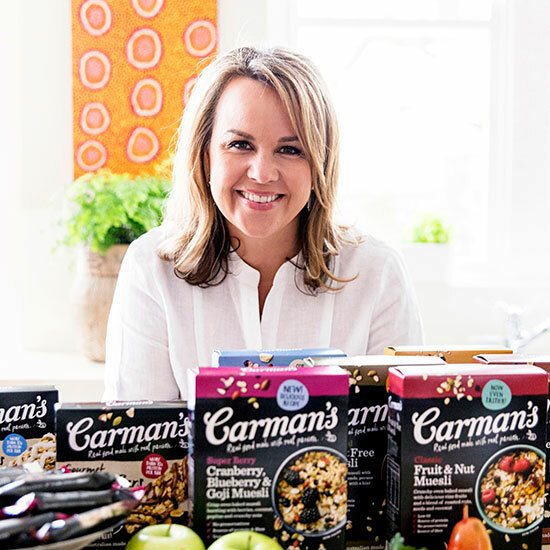 I still pinch myself when I think back to when I was an 18-year-old student, personally hand-making and packing each and every single packet of Carman’s muesli. I used to make deliveries next to Linfox semi-trailers out the back of my little Daewoo hatchback. My personal motto is: How can we be better? WHERE DO YOU THINK YOUR PASSION FOR FOODS BEGAN? I have always loved food but I have also always loved business. I even had a lemonade stand out the front of our house when I was in primary school so I guess you could say my passion started early. PASSIONATE PEOPLE ARE ALWAYS BEHIND FANTASTIC HEALTH GIVING PRODUCTS. WE WOULD LOVE TO FIND OUT ABOUT THE PASSIONATE PEOPLE BEHIND YOUR COMPANY. I'm so grateful to our entire team for their dedication in creating such beautiful products that meet people’s needs. We have 25 staff in our office. We have an unbelievable culture at Carman’s. Our staff are all dedicated, collaborative and positive. We work with integrity. I try to treat people at work as I would like to be treated myself. When my staff come to work, they have all the tools of the trade — like the most up-to-date computers — so they can get on and do their work. WHAT ARE SOME OF THE THINGS YOU DO TO MAINTAIN YOUR HEALTH AND WELLBEING WHILE LEADING A BUSY LIFESTYLE? I want to spend the weekends with my family. That’s my family time. If my family is not invited to an event, often the answer’s no. I really try and compartmentalize my work time and family time. Rest is important. I’m a huge one for trying to get to bed on time. I know that I need eight hours sleep every night to feel human, so I know I need to be in my bed at 10 o’clock. I have to have these things in my life so I can be rested so I can connect and so I’m not walking around like the walking dead because I’m feeling so exhausted about existing in life, not thriving. “I also do two book groups – I love doing my book groups! I feel I have a very rich and varied life and I’m so blessed with the opportunities that I’ve had — and I travel a lot, which is wonderful.